Eventually, you can find roofing problems that will seem really out of place. Some of these situations will be hard to fix and feel like you were not prepared for it, but we promise that everything has a fix. In Arizona, 1st Class Foam Roofing and Coating is the spray foam roofing contractor in Scottsdale that can fix any problem you may have with your roof, guaranteeing the fastest response in your area. If you have an old roof system installed, you will need to use procedures that are not up for today’s standards, making it tough to work with. On the other hand, if you have a modern roof system that is not as stiff and well-defined as an old roof system, it can bring you an opportunity to correct and adapt it to fix one of these unique roof problems that can appear. 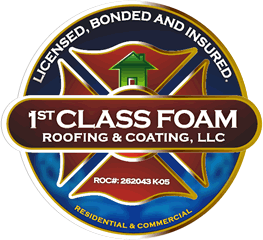 1st Class Foam Roofing and Coating strongly recommends having a spray foam roofing system since this foam is made right on the workspace with the combination of spray foam roofing materials. In this blog post, we will explain how a spray foam roofing can help you overcome some problems from different types of roofs. We don’t necessarily mean a roof full of holes, but things like ventilation systems, roof skylights, and other types of openings can make the work around them tough to deal with, including a potential waste of roof material. Instead of using traditional roof material, a professional foam roofing contractor like 1st Class Foam Roofing and Coating can use a spray foam that can be applied directly up to the edge of any system on the roof. A spray foam roofing system is so versatile; you won’t need to cut it or carefully plan how you will apply it. Spray foam just adheres instantly to any surface, making it one of the best roofing materials to work with. One of these kinds of roofs has a slope that goes from the flat center to the edge of the ceiling that ends in a round shape. Because of the rounded edges, we can say that these types roof looks like a barrel, making it dangerous to work on them. If you need more information on what to do with a barrel roof, you can contact a local foam roofing contractor, like 1st Class Foam Roofing and Coating. If you want to install a traditional roofing system on a barrel roof, it will be hard for you since regular roof shingles come in flat shapes that can’t accommodate very well with roofs that have round shapes. This is the reason why we recommend spray foam roofing that can be applied in any form, overcoming any complicated installation that a roof can have. WHAT HAPPENS IF THE CEILING HAS DIFFERENT LEVELS OR MATERIALS? Good question! Nowadays, there are a lot of old buildings that never had a long-term plan of changes, so that is why there are a good amount of buildings with different heights, roof shapes, and roof systems. If people want to upgrade or change their roofs for another type of roof systems, it will be difficult for the reason that the new individual sections need to be compatible with the old ones, for an easy foam roof installation in Scottsdale. In Arizona, 1st Class Foam Roofing and Coating can help you with a modern spray foam roofing system. It does not matter what type or material of roof is on the ceiling, spray from can form a layer on top of everything. It can be applied on different roof shapes, heights, materials, and more. Since Foam can be used as an extra layer, it can quickly solve any problem you can have with your roof. Installing a versatile spray foam roofing system is the specialty of 1st Class Foam Roofing and Coating in Arizona. The company’s owner Jason Rivers has 17 years of experience under his belt in residential and commercial foam roofing in Scottsdale, so it is guaranteed that you will receive the best quality service of all the commercial spray foam companies available. Our team of SPFA Certified Applicators with several years of experience is more than happy to help you with just a quick call. Don’t hesitate to contact us to know any information about what we offer.